A BMW with Texas plates will soon discover that multi-modal Durango does not have a Share the Sidewalk program to promote vehicular use of pedestrian sidewalks. This question should spark outrage. Not because of the egregious parking job. This drives drivers of the Ultimate Driving Machine nuts. It’s “Bimmer,” which rhymes with swimmer. Various sources – including regional BMW car clubs and a magazine called Bimmer – agree that “Bimmer” refers to the car. “Beemer” is the BMW motorcycle. “It has come up time and again,” according to a rant posted on a Boston BMW-owners-group website. “We gotta keep covering this issue until the world gets straightened out. It’s a simple, painless lesson. Learn now and avoid embarrassing yourself in front of other car enthusiasts,” writes the author, citing a “Very Highly Placed” BMW spokesperson. Closer to home, Action Line checked in with Kyle Young, service writer with Animas Automotive, which repairs BMWs. “Bimmer or Beemer?” Action Line asked. “I simply call it work,” Kevin said without missing a beat. 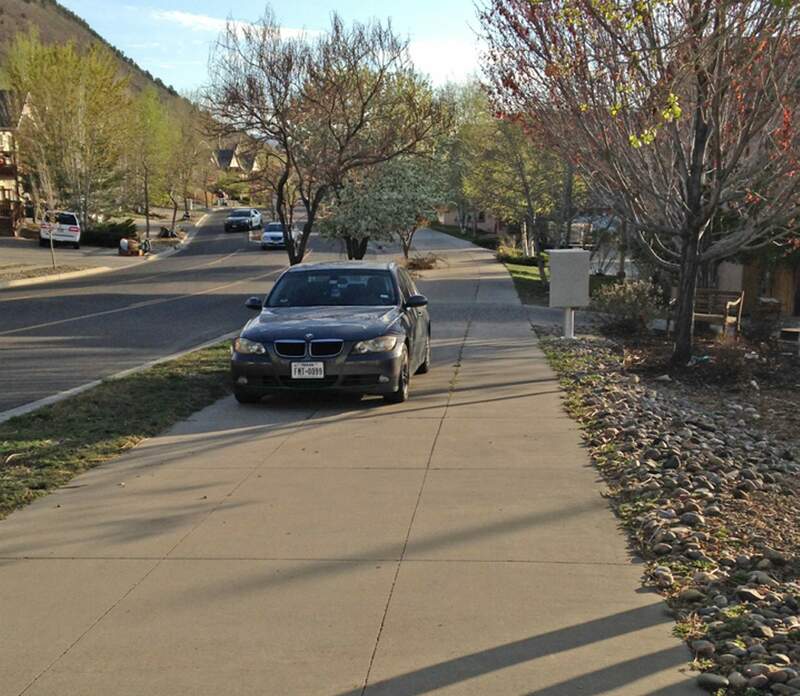 It’s a bummer when a Bimmer owner thinks it’s OK to park on a public sidewalk. Granted, the sidewalk is in the Skyridge neighborhood. Despite that enclave’s infrastructure shortcomings, the city of Durango has not created a VIP sidewalk parking pass. “I can tell you with absolute certainty that the city does not have a sidewalk parking program, Skyridge or elsewhere,” said our good friend Kevin Hall, assistant city manager, who has the thankless task of dealing with local parking issues. But look at the photo closely. In the background to the left, you’ll see a Durango Police car is on the way. Uh-oh. Perhaps this Bimmer bummer offers the perfect opportunity to include “car parking” in the proposed town ordinance that bans sitting or lying on sidewalks. However, such an amendment would be redundant, as the city code already curbs the curbside offense. Note that there are no exceptions for out-of-state plates. So why would a Texan park on a sidewalk? The answer became clear last week as Action Line was making hotel reservations for a conference in the Dallas-Fort Worth metroplex. “Walking’s healthy and I need to stir my stumps,” Action Line replied. Thus, Action Line will state he’ll stir alone in Texas. Call it the Lone Stir State. And exercise will be even more important because the conference features daily ice cream breaks. Email questions to actionline@durangoherald.com or mail them to Action Line, The Durango Herald, 1275 Main Ave., Durango, CO 81301. You can request anonymity if your other BMW is a Subaru.